I want to do a quilt using some machine embroidery in the blocks. However, I need help deciding on what combination of stabilizer and batting to use. I've seen some gorgeous quilts at shows...and some not so good. The problem of fabric sagging aound the embroidery seems to be common. Any advice is welcomed! I've done embroidered blocks in a few quilts. OESD makes a real thin fusible fleece that I put on the block fabric without any other stabilizer. Sometimes I fuse it to the fabric first but if I don't want to do that I just hoop it like stabilizer then cut it away from the embroidery after I've finished it. It's very thin but it does give just the right stability to cotton fabric. Then I just use my regular batting and backing. These are general instructions that I use for EMB quilts. Hoop No Show Mesh in your EMB hoop. There are many different vendors and I generally buy a roll of 25 or 50 yards at a time as it is cheaper. It is my go to for quilts, baby books, projects, etc. The design will stitch a placement line for batting. I have used Warm n Natural and also Dream Poly. Cut the batting ONE inch larger than placement line. Stitch it down and trim along the placement line. Then you will add the background fabric and stitch down. Some designs are made to do both steps at the same time. I like to trim the batting to keep it out of the seam lines. The other option is add a thin sheer layer to the applique fabrics and/or the background fabric. It's an iron on product. You really need to stabilize well to prevent puckers in the stitch out. I also use a water-soluble topping sometimes to keep the stitches from sinking into the fabric. Yes, some want to skimp on stabilizer but I consider it a little bit of extra help. If you check here and look under "projects" there are helpful tips for stabilizing. Another help is this work book. Some of the major designers have helpful tutorials included in their design instructions. I also trim out the NSM along the seam line and stitch together using the background fabric. Quilts are seamed with a HALF-INCH seam allowance for these EMB quilts. No show mesh is my go to stabilizer also- as Rhonda said, there are certain other treatments needed for special emb designs, so her advice is good! Then batting as usual! Embroidery is finally accepted at the Quilt shows now and the quilts are just gorgeous!! I embroidered 45 squares in this quilt after I put it together, so it is just stitched through the batting and backing and no special stabilizer used . I used my Monster Snap Hoop (which I love). Am getting ready to bind it today. The density of the embroidery pattern and the content of your fabric you are using for the design dictates the stabilizer needed to make the block. First I will say, there are whole books written on the subject. There are many questions you must ask depending on the way you will be making your blocks. Will they be a quilt as you go though all three layers while embroidering? A appliqued and embroidered block and then set into a top? Or just outline embroidery blocks you make, then made into a top and then quilted. If the latter I would suggest a cut away leave in to stabilize the individual blocks. Then the type of quilting you expect to do while completing the quilt. I like to do an image outline, echo that and then a background fill to my embroidery quilts. Thanks for the help! I'll try a couple of different ways and see what happens. light fmq and ruler quilting in between the embroidered stitches. I have done it this way, too. Looks good. So far, everyone's advice is focusing on the embroidery (which of course is important) but doesn't necessarily solve the problem of sagging. That is only corrected with quilting. Any block not quilted will sag. In the quilt you have shown, I cannot see any quilting. Nothing is holding the fabric to the batting and backing. 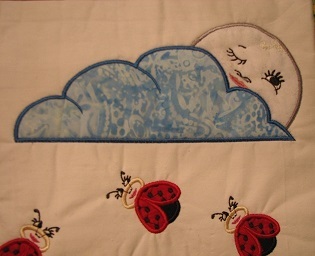 Ok, now I am looking at my embroidered quilts wondering what is this dreaded sag? Can you please describe what you mean? I just hoop a piece of stabilizer under my fabric an continue as I would with any embroidery. I do free motion quilt around the embroidery and it looks ok to my eyes. If I am doing something wrong I would like to fix it before I start to my next quilt. Sagging will happen is there is no stitching to hold the batting and backing together. So, yes, the blocks need FMQ around the embroidery design or applique fabrics. Some of the designs have stippling already programed into the design steps. It is generally done after tack down of batting and background fabric. If the design doesn't have the stippling, FMQ can be added. Some machines have stippling designs built into the machine. Easy to add to the applique design that doesn't have one. 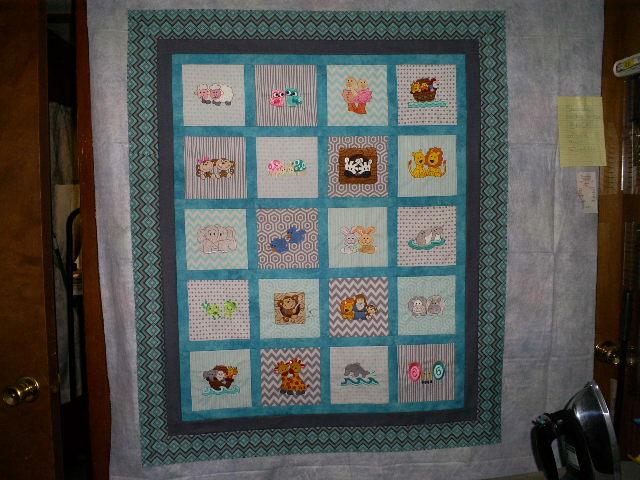 Here is one example for EMB quilts. This was a multi-hooped block. Each design in the block had to be re-hooped. There were empty areas with no quilting in the original design. This pic shows after the embroidery. You can see the the wrinkles, etc. The quilt was finished with a meaning around each design. 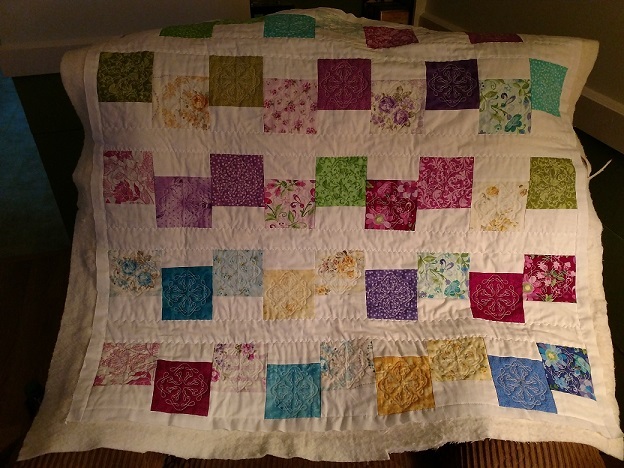 When completed there were no sags in the quilt blocks. Thank you for the explanation. I guess that by always free motion quilting around my designs I have never encountered that problem. I will be sure not to skip that.